Israeli authorities have given veteran Palestinian prisoners released Tuesday maps showing the places and streets they can go to within their own cities, says a freed prisoner. Samir Naneesh from Nablus in the northern West Bank had been detained in May 1989 and was sentenced to life imprisonment after he was convicted of killing an Israeli soldier by throwing a stone at him. He told Ma’an Thursday that the Israelis warned him and all freed prisoners that they would be detained again if they do not adhere with certain instructions the Israelis gave them. According to Naneesh, freed prisoners shouldn’t leave their cities or participate in any demonstrations or activities against Israel’s security. Violators will be taken back to prison, he added. 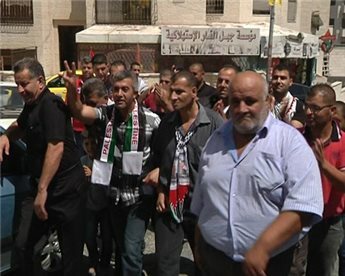 The Fatah-affiliated veteran prisoner highlighted during a reception organized by the movement in Nablus that his release was a dream he awaited impatiently. Naneesh’s parents died while he was in custody. "What Is a New Home Without the Sight of My Children?" 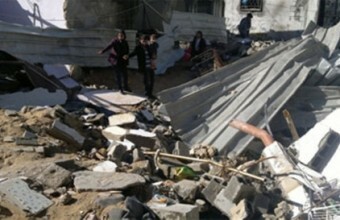 At approximately 19:20 on Monday 19 November 2012, during the latest Israeli offensive on the Gaza Strip, an Israeli military plane fired a missile at the house of Fouad Khalil Hijazi (46) in the north of Jabalya. The house was destroyed, and Fouad and his two children, Mohammed (4) and Suhaib (2), were killed. 28 civilians, including 7 residents of the house, were also injured in the accident. The house was reduced to rubble, totally levelled by the Israeli airstrike. Amna Hijazi (46), Fouad's wife and mother of the eight Hijazi children, was pulled from the rubble. Due to the severity of her injuries, she was transferred to a hospital in Al Arish in Egypt to receive medical treatment. A photograph of the Hijazi family funeral, taken by Swedish photographer Paul Hansen, became an iconic image of the November offensive and was named World Press Photo of the year for 2012 (http://www.worldpressphoto.org/awards/2013/spot-news/paul-hansen). Amna was not present at the funeral. When she awoke in the hospital, a few days after the attack, she was told of the death of her husband and two of her children. Prior to the attack, the Hijazi family consisted of ten members: Amna, Fouad, and their six sons and two daughters. All ten family members were at home when the airstrike shook the house. Fouad, Suhaib and Mohammed were killed instantly in the attack. The rest of the family sustained injuries. The wreckage of the Hijazi family home has since been removed and a new house stands in its place in the densely-populated area of Block 8 of Jabalya refugee camp. The only reminder of the attack is a sign hanging on the door which reads 'The home of martyr Fouad Hijazi'. Amna was separated from her shattered family for months while receiving medical treatment in Egypt, but is now settled in her reconstructed house and reunited with her surviving children. Recounting the events of the day, Amna says: "We were all sitting at home and following the news of the consistent attacks during the offensive. I kept my children around me. The little ones were playing on their bikes while the others were watching the news with us. The last thing I remember was watching the 'Breaking News' on TV. Then, suddenly, we were the news. When I woke up, I was told that I had been found somewhere near the stairs where I was buried under the wreckage of my own house." After six days in a hospital in Al Arish, Amna was transferred to Salam Hospital in Cairo. When she finally awoke, she was suffering temporary memory loss: "I woke up in the Intensive Care of the Salam hospital in Cairo. I did not remember what had happened. I did not know why I was in the hospital. My cousin, who had accompanied me to Egypt, told me that I had fallen, but I couldn't remember falling so I could not believe her. I could not remember that the house had been directly targeted. However, visitors kept coming and I started to sense that there was something wrong. But they kept lying to me. They didn't tell me that the house had been bombed. Then I started recollecting the events of the days of the offensive. I started to remember that Gaza had been under attack and that people were dying. I started enquiring about my little children, Mosa'ab, Sohaib, and Mohammed. They were the youngest. When I was informed that my husband and my two little children had been killed, life turned black in my eyes, and I wished I were dead too. They were just children. They were only playing." Amna spent two weeks in hospitals in Egypt and then returned to Gaza, where the lack of proper medical treatment resulting in a worsening of her condition. She was forced to leave her family again in order to access proper medical treatment in Egypt. At present, due to her severe head injury, she is still unable to control her movements and cannot walk properly. However, Amna, now the primary caretaker for the family, felt the need to return to Gaza to try to piece together a life for her children. "When I came back, everyone met me at the hospital, except for my daughter Nour. When I saw her at home, lying on her back and unable to move, I realised that she had also been injured. I started weeping. She had to spend two months in bed and another month not moving. Suhaib's twin brother was psychologically traumatised. He was feeling the loss of his twin brother. He had difficulties in speaking. When he first started speaking again, he would just point to the poster of his father and to Suhaib's picture. The children were badly affected by my absence. They became very unsettled, and we haven't managed to settle back to our life yet." 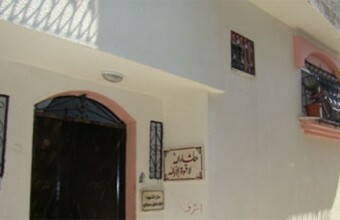 The Hijazi family spent around three months in a rented house before their home was reconstructed. However, as Amna explains, the reconstruction of the house cannot compensate for the loss of human lives: "What is a new home without the sight of my children? What is a brick without their laughter? They made the house alive. Now, they are gone. They were killed here. They were buried by the rubble of this house where we are sitting. I remember them every day. During Ramadan, I remembered how we used to sit around the same table like a family. I would have understood it if they had been holding a gun and resisting but they were not; they were only children. They didn't understand what was happening around them." The extensive destruction of property was a prominent feature of the latest Israeli offensive, during which civilian objects were often the direct targets of Israeli military planes. According to follow-up investigations by PCHR, 61 civilian houses were directly targeted by Israeli military planes during the last offensive. The bombing led to the complete destruction of 126 houses, as well as 191 building units which were home to 216 families comprising 1,229 members, of which 710 were children. In most cases, families did not receive any warning before their houses were directly bombed. Homes were demolished while their civilian residents were present. For anyone, the loss of a home is very painful, but Palestinian women in particular tend to invest all their resources in their homes. For women like Amna, the end of the offensive was not the end of the struggle; they were then faced with the task of rebuilding their destroyed homes and piecing together their shattered lives. With the lack of any sustainable income, especially for families that have lost their breadwinners during the offensive, rebuilding one's house is an extreme financial burden. Women become even further traumatised by the fear of economic hardship and impoverishment resulting from losing one's home and property. As a result, many become aid-dependent, damaging what self esteem and sense of independence they have left. As a legal representative of the Hijazi family, PCHR is following up their legal case locally and internationally. 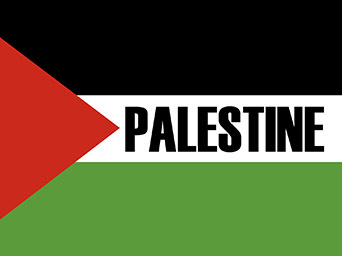 On 23 December 2012, PCHR filed a civil complaint with the compensation office of the Israeli authority clarifying that the attack was carried out against mere civilians which is prohibited by international humanitarian law (IHL) and demanding remedy for victims. On 2 February 2013, the compensation office replied acknowledging that they received the complaint and they will take due procedures. On 8 June 2013, PCHR received another response requesting an original power of attorney and further information on the specific location of the attack. Another complaint was filed with the military prosecutor on 10 February 2013 demanding criminal investigation of the attack and legal prosecution. However, PCHR received no response in regard of the investigation up to this moment. As the Occupying Power of the Gaza Strip, Israel must fulfil its obligations under the international human rights treaties and covenants it has signed and ratified. Under IHL in particular, the principle of distinction demands that parties to a conflict must, at all times, distinguish between civilians and combatants, and civilian objects and military targets. Violations of this principle constitute war crimes, as defined in, inter alia, Articles 8(2)(b)(i), and (ii) of the Statute of the International Criminal Court. Depending on the scale of such attacks, and whether they form part of a plan or policy, such attacks may also constitute the crime of willful killing and be a grave breach of the Geneva Conventions. In addition, international humanitarian law (IHL) requires that any attack must be proportionate. An attack which may be expected to cause incidental loss of civilian life, injury to civilians, damage to civilian objects, or a combination thereof, which would be excessive in relation to the concrete and direct military advantage anticipated. Furthermore, under the principle of precaution, customary IHL requires that all feasible precautions must be taken to avoid, or at least to minimise, incidental loss of civilian life, injury to civilians and damage to civilian objects. IHL grants children two forms of protection: first, the general protection granted to them as non-combatant individuals; second, special protection as they are considered to be a particularly vulnerable group in times of war and armed conflict. According to Article 53 of the 1949 Fourth Geneva Convention, any destruction by the Occupying Power of real or personal property belonging individually or collectively to private persons, or to the State, or to other public authorities, or to social or cooperative organisations, is prohibited, except where such destruction is rendered absolutely necessary by military operations. Article 147 of the Fourth Geneva Convention states that extensive destruction of such protected property, which cannot be justified by military necessity, is a grave breach of IHL. In addition, Article 8(2)(b)(iv) of the Rome Statute of the International Criminal Court states that it is a war crime to intentionally launch an attack in the knowledge that such an attack will cause incidental loss of life, injury to civilians, damage to civilian objects, or widespread, long-term and severe damage to the natural environment which would be clearly excessive in relation to the concrete and direct overall military advantage anticipated. 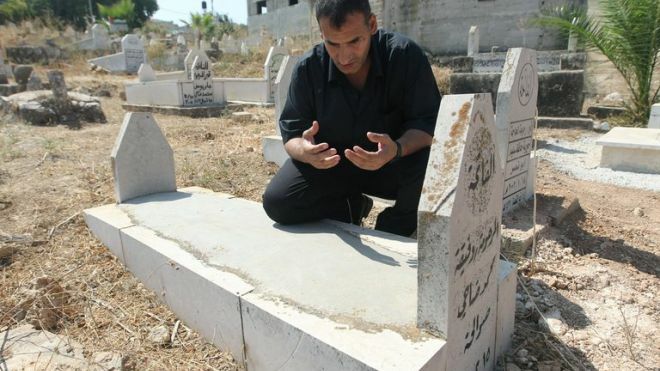 Released Palestinian prisoner Hosni Sawalha prays at the graves of his parents -- who died while he was in an Israeli jail -- in the the West Bank village of Azmut, on August 14, 2013. Tears streamed down Sawalha's face as he recited from the Koran alongside the graves of his parents, who died while he was in Israeli jail since his teens. The 40-year-old and his cousin Mohammed Sawalha were released alongside 24 other long-serving Palestinian inmates early on Wednesday, hours before a new round of peace talks with Israel. "I still can't believe I'm free," Hosni said on arriving at 3:30 am (0030 GMT) back to his hometown of Azmut, near Nablus in the West Bank. He and Mohammed received a heroes' welcome from villagers, friends and family, who gathered to cheer the return of their native sons, who had served 23 years of a life sentence. The two men, alongside accomplice Jaafar Duweikat, were arrested during the first Palestinian intifada in 1990, accused of stabbing and killing one Israeli and wounding three others aboard a bus near Tel Aviv. 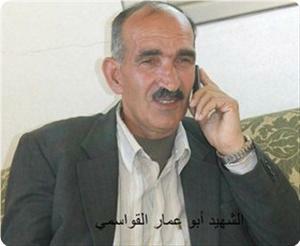 Duweikat was shot dead by the bus driver. "Mohammed and Hosni are heroes, seen by their contemporaries as imprisoned in Israel for the sake of the (Palestinian) nation," said Ghassan Mohammed, a 37-year-old taxi driver. Mohammed and Hosni were reluctant to talk about their actions, both saying they now simply wished for peace. 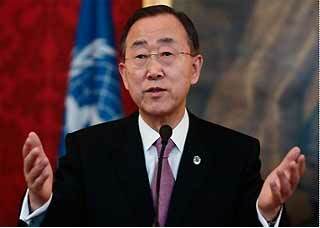 "I hope the resumption of talks will achieve something and won't just be a waste of time. I hope we can gain our rights and all our prisoners are freed," said Mohammed, also 40. The men said they wanted to resume their normal lives, move on and perhaps get married. "Our release was a big surprise, because we thought we'd be among the last batch of prisoners," Hosni said. Israel has agreed to release a total of 104 prisoners, most of who were jailed before the 1993 Oslo peace accords, in stages depending on progress in the new talks. Mohammed's mother Umm Yusif, in her 70s and the last remaining of the two cousins' parents, smiled from ear to ear, ululated and sang as they arrived back in Azmut. "This moment is the happiest of my life," she beamed, saying that she could not wait to feed her son. Hosni and Mohammed barely recognised many of those who flocked to greet them, especially the younger villagers born after the two men were incarcerated aged 17. Hosni finished reading the Fatiha, the opening passage of the Koran that is recited for the dead, and stepped back from his parents' graves. He and Mohammed said they would soon set off for nearby Araq al-Taye to visit Duweikat's family. Official spokesperson Eduardo del Buey confirmed that United Nations Secretary General, Ban Ki-moon, will travel this week to Jordan, Israel and Palestine to discuss the current situation in the Middle East and the progress in peace talks recently resumed. In Amman, the head of the UN will talk with king Abdala II and the Foreign Minister Nasser Judeh. After that he will go to Ramallah, where he will hold a meeting with Palestinian president, Mahmoud Abbas; and Prime Minister Rami Hamdallah, and visit the tomb of historical leader, Yasser Arafat. Later on he will visit Jerusalem to speak with Israeli President and Prime Minister, Shimon Peres and Benjamin Netanyahu, and render tribute to deceased head of government Yitzak Rabin. Ban Ki-moon will also meet the heads of the delegations of Israel and Palestine to discuss peace negotiations that were recently resumed in Washington. The tour of Ban Ki-moon through the zone coincides with the announcement made by Israel of the construction of 1,200 new Israeli settlements in occupied Palestinian territories which are considered illegal by the United Nations. 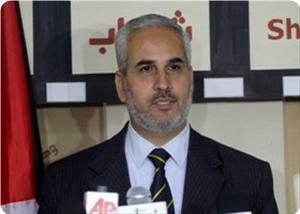 Hamas spokesman Fawzi Barhoum revealed that Fatah's Media Security Committee provided to some Tunisian media false reports and fabricated information targeting Hamas, the Palestinian people and resistance. Barhoum condemned in a statement on Monday Fatah allegations that claim that the Palestinians in Tunisia have been training elements of the Tunisian Ennahda Movement. He pointed out that Fatah "is using the same scenario and plan, used in Egypt to demonize Hamas" and is determined to continue discrediting the Palestinian people and their resistance. 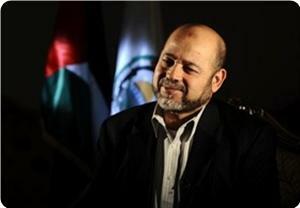 The Hamas official pointed out that the media security committee formed by Fatah, and which is based in the Palestinian embassy in Cairo, is led and supervised by the Palestinian intelligence service in Ramallah and the PA leadership office in the Muqata'a. He called on Fatah to "immediately stop this dangerous scheme, which serves only the Israeli enemy," and urged all Palestinians to hold all those involved in this incitement accountable and expose their lies. 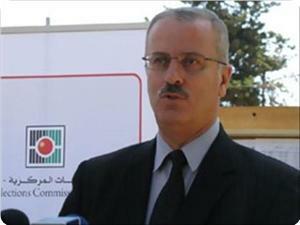 Barhoum also called on the Tunisian media not to deal with these accusations and fabricated reports. Palestinian Prime Minister Rami Hamdallah has retracted his resignation and agreed to work to form the next Palestinian government after meeting with Palestinian President Mahmoud Abbas. 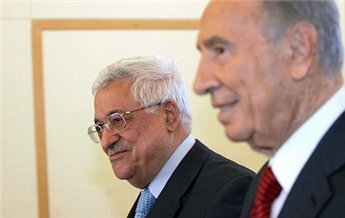 Nabil Abu Rodina, Abbas's spokesman, said that Palestinian law mandates the government be formed within five weeks time. 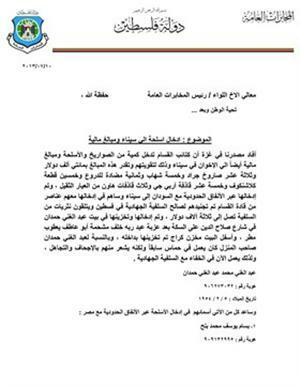 Two months ago, Hamadallah handed in his resignation only 18 days after being appointed in wake of reported tensions with Abbas regarding appointments of deputy prime ministers. Palestinian President Mahmoud Abbas received Tuesday caretaker Prime Minister Rami Hamdallah where he has re-assigned him to form the new government. Hamdallah has got five weeks to form the new government as stipulated by the basic Palestinian law, said Nabil Abu Rdineh, the spokesperson of Abbas. On June 23, Hamdallah resigned after 17 days in office, protesting lack of enough authority and power as a prime minister. Accrediting Hamdallah to stay as prime minister came a day before the end of a three-month ultimatum in which Fatah and Hamas movements agreed to form a unity government. President Mahmoud Abbas received Tuesday at his office in Ramallah Prime Minister Rami Hamdallah and asked him to form the new Palestinian government, according to presidential spokesman Nabil Abu Rudeineh. He said Hamdallah, who resigned on June 21 and became a caretaker since then, will have five weeks to form the new government. AICafe invite you on Tuesday 13 August 2013 from 7.30 p.m. for a presentation and discussion about Youth in Palestine. UN International Youth Day is commemorated yearly on 12 August to recognise the efforts of world youth in enhancing global society, and to promote ways to engage youth in becoming more actively involved in making positive contributions to their communities. The role of Arab youth over the past two years in demanding political change throughout the Middle East is awe-inspiring and a model for their counterparts in other parts of the world. 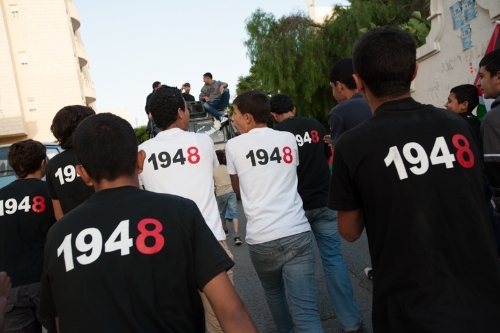 From the slums of Tunisia to the squares of Cairo, in the markets of Algeria to the streets of Bahrain, Arab youth have played the central role in pushing for democratic change and the promotion of human and political rights in their societies. Where are the Palestinian youth in this wave of change? What role have Palestinian youth played in demanding an end to Israel's occupation and how has this role changed through the First Intifada, Oslo political process and Second Intifada? Where are Palestinian youth regarding the Fatah-Hamas divide in Palestinian society and what can we expect from them in the near future? These questions and more will be explored in an evening not to be missed. Before sale of the rest of Palestine by the traitors of PLO to the israeli zionist occupation, the Palestinian Return Centre (PRC) and the Exeter Institute of Arab Islamic Studies (IAIS) is in the final stages of preparation for the International conference marking the 20th anniversary of Oslo. 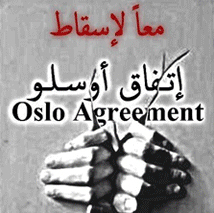 The two day conference from Saturday 7 October to Sunday 8 October, which includes leading experts, analysts, researchers and a number of government officials, will discuss the impact and future of Oslo. Confirmed speakers include: Professor Rosemary Hollis (Professor of Middle East Policy Studies), Dr Ghada Karmi (leading Palestinian activist, academic and writer author of Married to Another Man), Professor Illan Pappé, Arab and Islamic Studies – University of Exeter, (Author of the Ethnic Cleansing of Palestine). Other speakers include: Rawan Al Damen, Producer and Director, Programs Department Al Jazeera, Director of Al Nakba film series, Dr Daud Abdulah (Director of MEMO), Petter Bauck (Senior Advisor on conflict-related issues in the Norwegian Agency for Development Cooperation and Editor of upcoming book on Oslo), Oroub El-Abed, (PHD Researcher Associate Member SOAS), Gillian Kerr-Sheppard (University of Sydney), Emile Badarin (PhD student in Middle East Politics, his research is focused on the Palestinian political discourse between exile and occupation), Majed Al Zeer(General Director of PRC), Nasim Ahmed (Senior Researcher PRC and Author of Understanding the Nakba), Muhammed Hamid (Chair of PRC board of Trustee). Dr. Mousa Abu Marzouk, a political bureau member of Hamas, has underlined that reconciliation was a must for his movement but needed cooperation of other parties to be accomplished. Abu Marzouk said in a statement on his Facebook page on Thursday that Hamas was adamant on going ahead with national reconciliation and ending internal division. 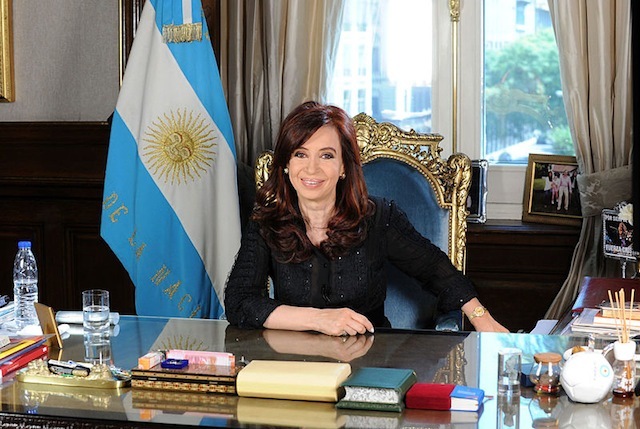 He explained, however, that other parties have also obligations to make in order to make this process a success. The Hamas leader questioned Fatah’s seriousness in accomplishing reconciliation as it did not adhere to any of the agreed upon points in this regard. Hamas movement mourned the Palestinian citizen Jawad Imran Qawasmeh, 55, the father of the martyr Fuad Qawasmeh who was killed Wednesday after being shot by several bullets near his house in al-Khalil. In a statement on Wednesday, Hamas called for prosecuting the killers who dare to attack martyrs' families without mercy. Jawad Qawasmi was martyred after being shot with six bullets by unidentified persons near his house. The Hamas movement extended its felicitations to the Palestinian people and the Arab and Islamic world over the advent of the blessed Eidul Fitr. 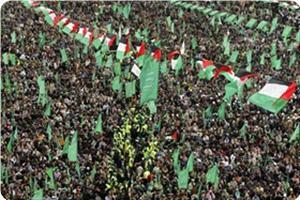 Hamas hoped in a press release on Thursday that the next Eid would bring with it liberation and victory and return for the Palestinian people and unity and progress for the Islamic Nation. Hamas prayed that Allah would “bestow on us the greatest joy of all mainly the liberation of the land, the Aqsa, and the prisoners”. 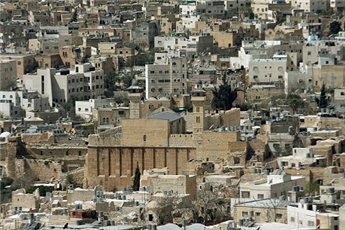 Unidentified gunmen shot and killed a 60-year-old man in Hebron on Wednesday after robbing him, relatives and security sources said. Jawad Omran al-Qawasmi, who owned a money exchange in Hebron, was shot dead in the Wadi Abu Kteileh area of the city on his way to work, his family told Ma'an. The assailants stole cash from al-Qawasmi and fled the scene, the relatives said. 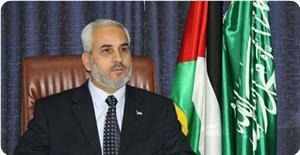 A source close to Mahmoud Abbas said the president had called al-Qawasmi's family to offer his condolences. Abbas has ordered the Minister of Interior to form a special commission to find the perpetrators as soon as possible, the official told Ma'an. Hamas movement has presented new documents that prove Fatah’s involvement in the Egyptian incitement campaign against the movement. These new documents reveal a part of the plot intended by the Fatah-controlled Palestinian authority (PA) to incite against the Movement and the besieged Palestinians in the Gaza strip, the movement said in its statement. The Movement presented three new documents addressed to Majid Faraj, the head of the Palestinian Authority General Intelligence Service, accusing Hamas of allegedly smuggling weapons to the Muslim Brotherhood in Egypt and sending 100 members of the Qassam Brigades to Sinai in order to support Muslim Brotherhood. Another documents claimed that 20 elements of Qassam Brigades were sent to Cairo to secure deputy head of Hamas political bureau Mousa Abu Marzouk's house. According to the mentioned documents, there are shared information and field coordination between PA and Egyptian security services. A smear campaign was waged by Egyptian media against Hamas movement and Palestinian people in the Gaza Strip besieged since 2006.